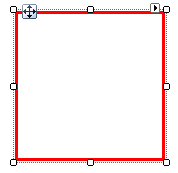 The BorderPrimitive class is responsible for drawing the border around an area on the screen. BorderPrimitive is automatically sized to the inner edges of the parent element. The BoxStyle property controls display characteristics and can be set to SingleBorder, FourBorders and OuterInnerBorders. All four sides of the border are drawn with the same properties except color. Color is controlled by the GradientStyles property. To get all colors in the border to display the same, use the GrandientStyles.Solid enumeration member. The example below displays a red, 3 pixel border box. Each side of the border can be tailored individually. ForeColor , Width and GradientStyle properties are ignored in favor of width and color properties for each side. 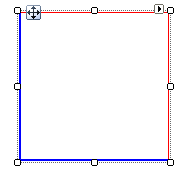 The example code below describes a box with the left and bottom sides displaying a 3 pixel blue line and the upper and right hand sides displaying a 1 pixel red border. Inner and outer colors can be specified using the ForeColor and InnerColor property families. The GradientStyle property determines how the primitive colors are displayed. A Solid GradientStyle will only take the ForeColor and InnerColor properties into account. The code example below sets a 1 pixel width, sets the GradientStyle to Linear, sets the ForeColor related properties to blue and green colors. The InnerColor related properties are set to light blue and green colors.